The entrance to the popular Gates of Lodore stretch on the Green River, not far downstream from where Aaron Million of Ft. Collins has proposed to divert 55,000 acre-feet of water from the river each year and pipe it to the Front Range. There’s plenty of opposition to the idea, but there is also interest in the water in eastern Colorado. It has been called speculative, foolhardy and overly expensive, but Aaron Million’s plan to pump water from the Utah-Wyoming border to Colorado’s Front Range just won’t dry up. Now seeking water rights from the Green River in Utah for a new version of his plan, Million thinks he has fashioned a winning proposal to feed Colorado’s thirsty, growing population. While Million’s proposal has drawn criticism from environmental groups and government agencies, some Front Range water suppliers have expressed interest in water from the pipeline. The Central Colorado Water Conservancy District, based in Greeley and serving Weld, Adams and Morgan counties, has re-affirmed its interest in the project, which it first expressed in 2009. And the state of Colorado has taken a neutral stance. 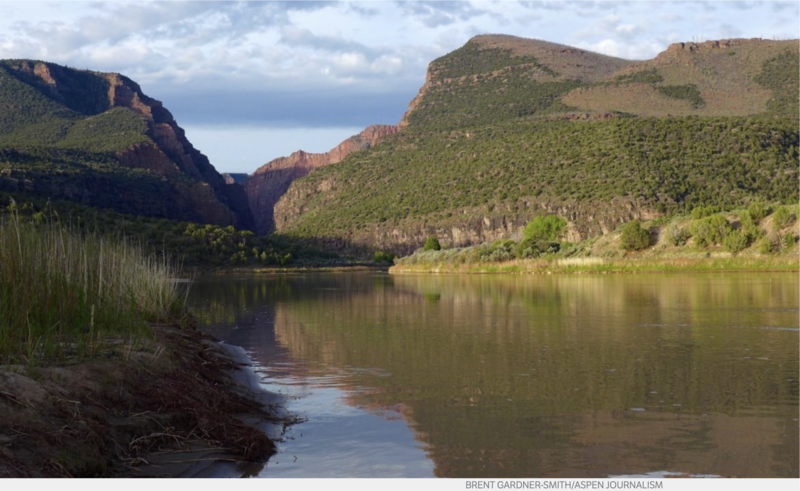 Million, under the banner of a new business, Water Horse Resources LLC, is now proposing a project that would divert 55,000 acre-feet of water each year from the Green River in eastern Utah, below Flaming Gorge Reservoir near Brown’s Park and above Dinosaur National Monument. (See application and map, and click to zoom in on map). An acre foot of water is roughly equivalent to a foot of water covering an entire football field, and enough to satisfy two small families’ yearly demands. With 55,000 acre feet, the project, if it ever comes to fruition, could serve 110,000 families each year. It could also satisfy more than 10,000 acres of flood-irrigated farmland. The water, up to 76 cubic feet per second, would travel in a pipeline that heads northeast out of Utah, cuts across a corner of Colorado, traverses 500 miles through Wyoming and over a low point in the Continental Divide, and then drops back into Colorado. Because the pipeline would ultimately descend about 3,800 vertical feet, the water could power turbines that would generate about 70 megawatt hours of power per year. For the project’s second phase, Million hopes to build pumped-storage facilities, which could fill with water during the day when energy is in low demand and release water through a turbine when demand is high, generating an additional 500 to 1,000 Mwh of power annually. Aaron Million testifying on the application from Water Horse Resources LLC at a State of Utah hearing on Nov. 11, 2018 in Salt Lake City. The project’s opponents have pointed out problems for endangered fish, recreation and water availability. To bolster their claims many have pointed out that Million has yet to reveal a buyer for his water, and say that’s evidence that there is no interest in Green River water in Colorado. But Million claims to have a buyer on the Front Range interested in purchasing the entire water supply, and other Front Range water providers have expressed their willingness to consider water from the pipeline. For his water rights application, Million presented 17 letters of interest to Utah’s state engineer. Most of these letters were from a different pipeline application in 2010, but there was one from January from the Central Colorado Water Conservancy District, or CCWCD. The CCWCD serves about 550 farmers, but because the district is short of water, it is able to make only about half of its deliveries. In November, voters passed a $48.7 million bond issue for the district to buy new supplies, and the CCWCD said it would consider water from a Flaming Gorge pipeline. 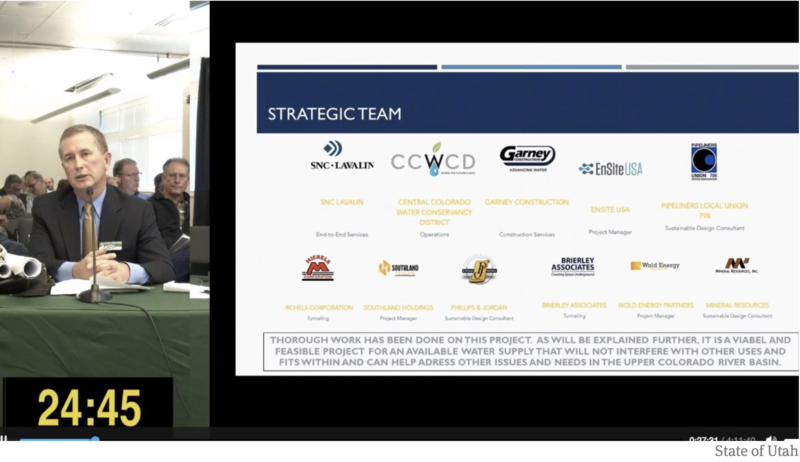 According to Million’s testimony before the State of Utah’s Division of Water Rights on Nov. 11 the CCWCD has joined his project’s advisory board. “They have a huge demand-supply imbalance on the South Platte in Colorado they are looking at,” Million said. 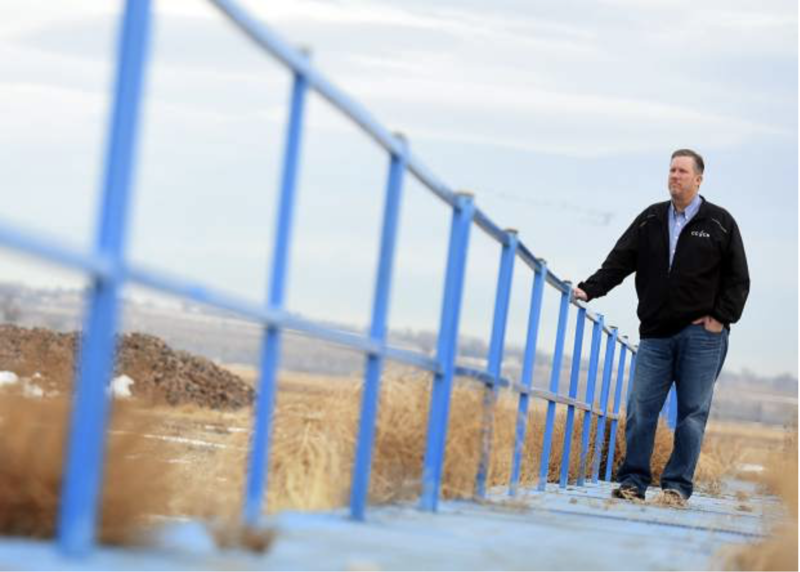 Randy Ray, executive director of the Central Colorado Water Conservancy District, stands on top of the grate protecting a ditch that runs from an artificial recharge facility near Gilcrest. The CCWCD has expressed interest in water being piped into the Front Range. A detail of a map produced by Water Horse Resources, and published by the state of Utah, showing a pipeline in relation to the service of several Front Range water providers. The numbers below the names of the water providers correspond to amounts of water, in acre feet, that may of interest to various water providers, according to Aaron Million. One night in 2003, Million stumbled across an old map in the library at Colorado State University, where he was a graduate student in resource economics. He focused on the northwest corner of the state where the Green River comes down from Wyoming into Utah and then comes in and out of Colorado in a sweeping oxbow before traveling down to meet the Colorado River in Canyonlands National Park. Free from the clutter of roads, this 1920s map made the thick, blue squiggle so obvious that it suddenly gave Million an idea to bring that water to the Front Range. “I thought that surely someone had thought about that,” Million said. The project became his master’s thesis and, later, a proposal for a real project. 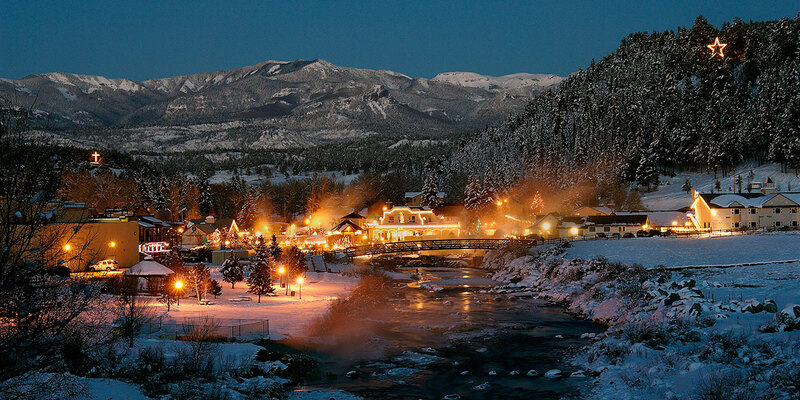 The original concept looked at importing nearly 250,000 acre-feet of water from a point of diversion in Wyoming. He filed applications for different versions of his concept under the companies Million Conservation Resource Group Inc. and Wyco Power and Water Inc. Both applications were dismissed by government agencies for a lack of information earlier this decade. The new plan scales back the amount of water to be drawn from the river and includes an emphasis on hydropower along with water delivery. The company has not released a detailed cost estimate to the public, but Million says estimates range from $860 million to $1.1 billion. He also says private consultants have put the project’s ultimate value at more than $30 billion. With these new pieces in place, Million believes this project has a better chance, but he’s facing opposition on many fronts, permit challenges and a daunting environmental-impact study. A section of the Green River near Browns Park close to where Aaron Million of Ft. Collins has proposed diverting 55,000 acre-feet of water and piping it to Colorado. The Central Colorado Water Conservancy District has expressed interest in the water. 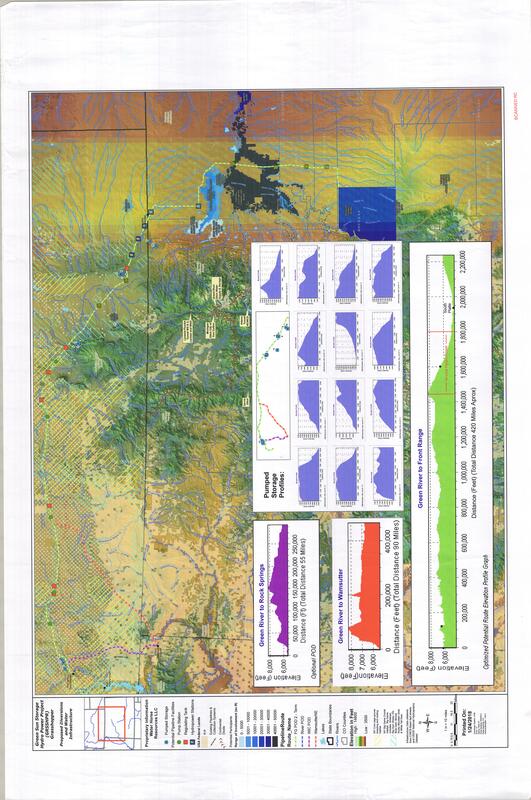 A detail of a map produced by Water Horse Resources, and published by the state of Utah, showing the proposed diversion point on the Green River, between Flaming Gorge Reservoir and the Gates of Lodore in Dinosaur National Monument. 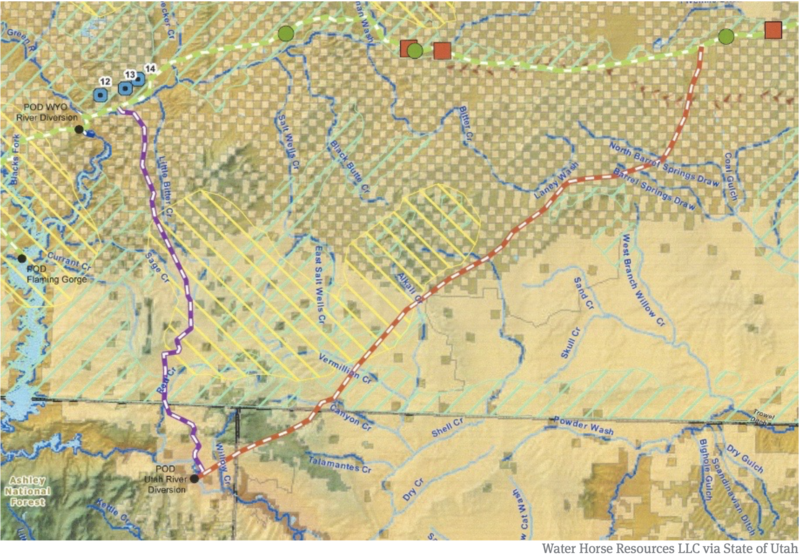 The red and white line represents a pipeline that heads northeast out of Utah, across a corner of Colorado, and into Wyoming, where it joins an alignment of another potential pipeline that is connected to the Green above Flaming Gorge. Million’s latest filing for water rights in Utah, in January, drew 28 protest letters, from environmental groups, concerned citizens and water districts, as well as from U.S. Bureau of Reclamation and the Department of the Interior. Many of the presentations against the water project cast doubt on whether there was even any water in the Colorado River system left to take. Still, the most common concern was that Million had not released a signed contract that showed someone would buy the project’s water. At the project’s water-rights hearing at the Utah state engineer’s office in November, several groups pointed to fields on Million’s application where the purpose and place of use were left as “TBD,” or to be determined. “That just smacks of speculation,” said Ariel Calmes, a staff attorney for Western Resource Advocates, which is also opposing the project. But while Million and his team have struggled against public backlash and weathered claims that there was no interest in Green River water, other water entities in Colorado have quietly picked up his idea. In 2006, just as Million was getting his initial idea off the ground, the South Metro Water Supply Authority — a group of water suppliers south of Denver — launched studies for an almost identical project, and another group near Colorado Springs released a study into a Flaming Gorge pipeline in 2013. The governor’s water advisers also took note of Million’s plan, and Colorado’s 2010 Statewide Water Supply Initiative included a Flaming Gorge pipeline as one of four possibilities for new water supplies for the state. 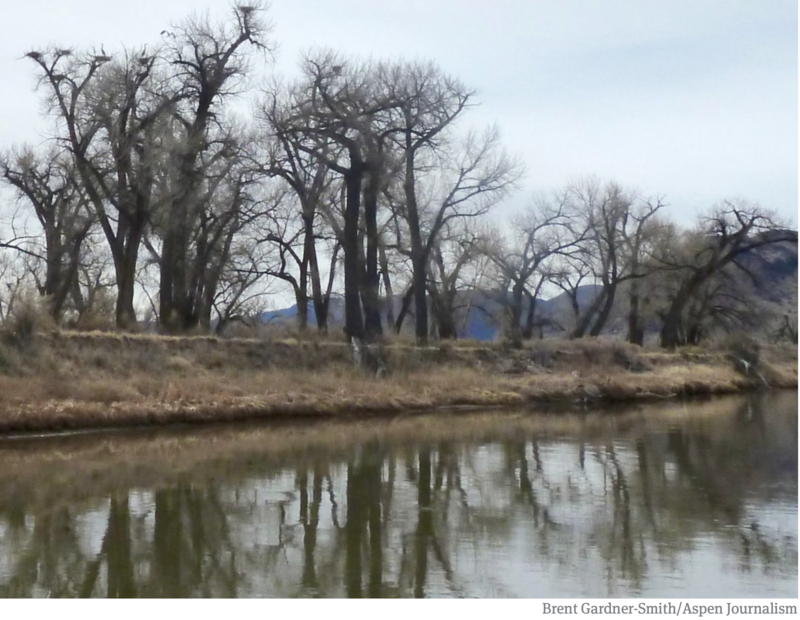 That same report found that the South Platte Basin, which includes all of northeastern Colorado, would need as much as 330,000 acre-feet more water to meet demand projections by 2050. While the state has not come out firmly in support of Million’s project, the Colorado Water Conservation Board said in a July 7 letter that it did not oppose the Utah application. The letter indicated that the Colorado state engineer would need to weigh in on the proposal if the Utah water rights were secured. Million is quick to swat away arguments that his project is speculative, noting that water demand in Colorado has only grown since he first conceived of the pipeline. He also claims an entity with “large ranching and municipal interests” has already agreed to take all the water at a specific price. He also said he is in preliminary conversations about a power-purchase agreement for the renewable energy that the pipeline would generate. Due to continuing negotiations and a nondisclosure agreement, Million said he would not reveal either of the two interested parties at this time. But scrutiny of Million’s latest plan is increasing. 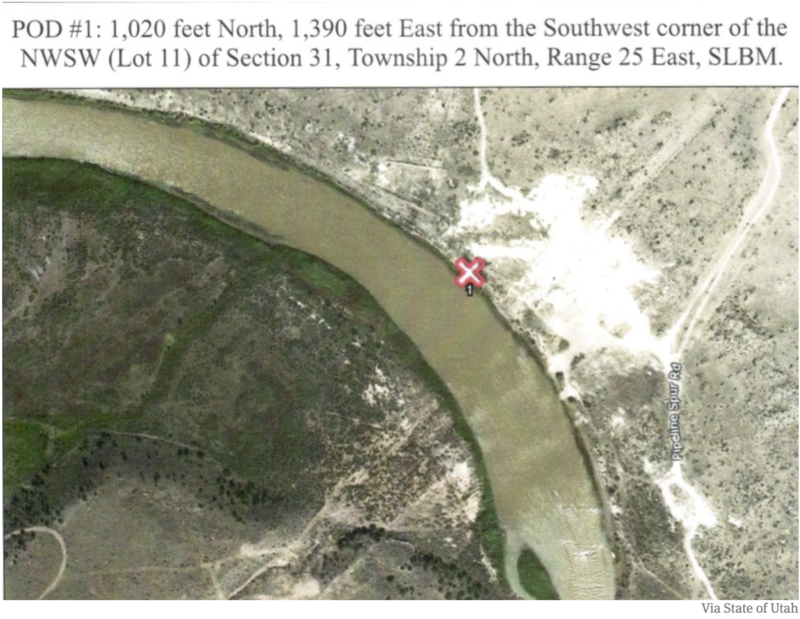 A map filed by Water Horse Resources LLC with the state of Utah, showing a diversion point on the Green River, between Flaming Gorge Reservoir and the Gates of Lodore. Million said the spot was chosen because a number of existing oil and gas pipelines already cross the river at this location. 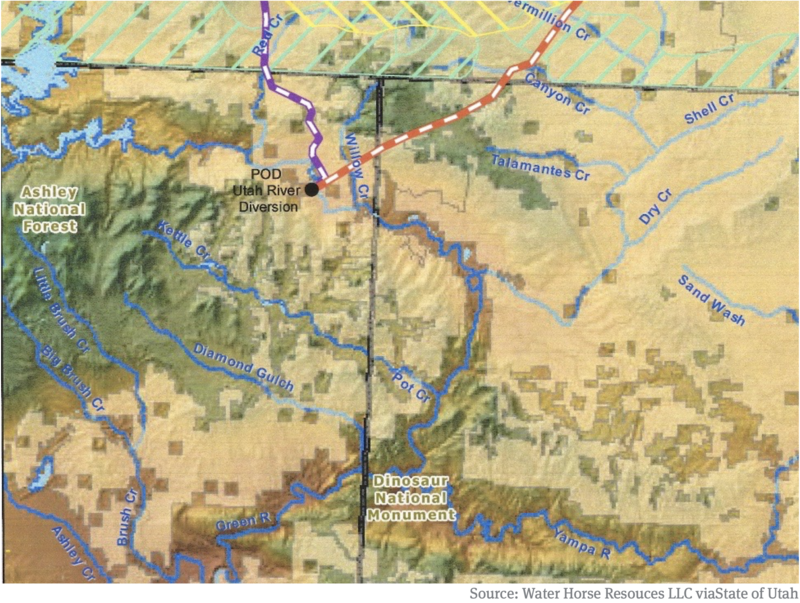 A detail of a map produced by Water Horse Resources, and published by the state of Utah, showing two pipelines from the Green River, one above Flaming Gorge Reservoir and one below, plus a connecting pipeline between the two. The map is on a Utah state website with a note saying it was “left at hearing” on Nov. 11, 2018. On Dec. 10, the Utah state engineer’s office requested additional information from Million to evaluate his application. 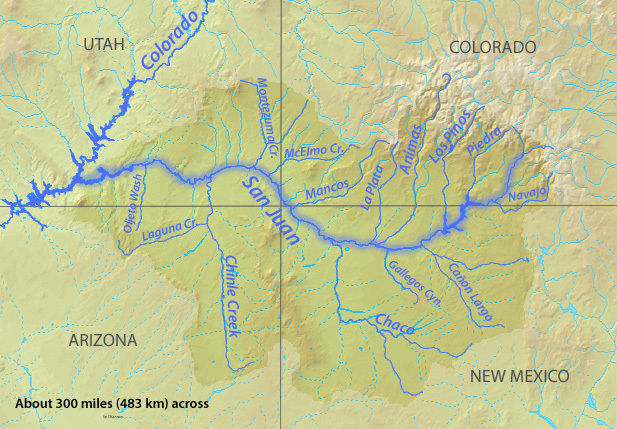 The request asked Million to prove that water was available in the Colorado River system and that water taken from his pipeline would come from Colorado, not Utah’s, share of the river. The requests also sought further proof of feasibility, but did not request additional proof of demand or a contract for the purchase of the pipeline’s water. 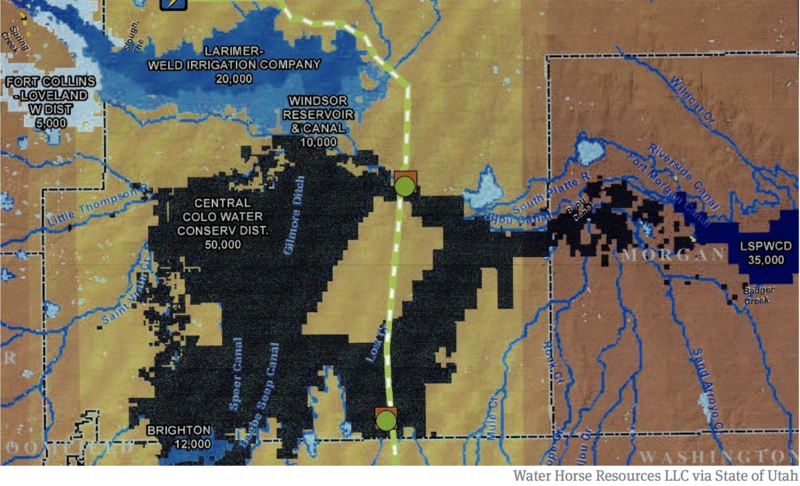 Water Horse Resources has until Feb. 8 to supply the new information. Million is confident that his project, this time around, will move forward. He says the protests and the noise from the public don’t get to him anymore. Editor’s note: Aspen Journalism is collaborating with the Greeley Tribune on coverage of regional water issues. The Tribune published a version of this story on Sunday, Dec. 30, 2018. Earlier this year, the Colorado General Assembly approved a bill that requires those who operate motorboats and sailboats on waters of the state to purchase an ANS stamp annually. The cost of the stamp for Colorado residents is $25. For boaters coming to Colorado from other states or provinces the stamp will cost $50. The stamp fee is separate from the annual boat registration permit but will be included in the cost of registration for in-state boats. The stamp and registration is currently available for residents at CPW offices and the agency website. Boaters coming from other states can buy their stamp online, at CPW offices or at any sales location beginning January 1, 2019. Mussel infestations cause a variety of major problems. Because mussels consume plankton they disrupt the food web and out-compete sport fish and native fish. 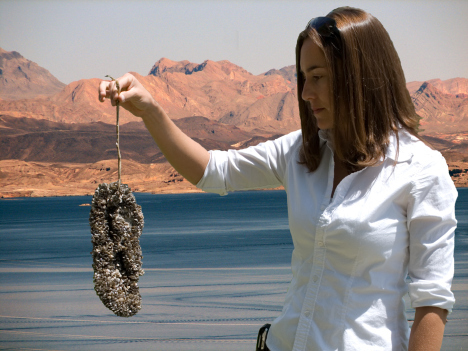 Mussels clog infrastructure, including reservoir dams, outlet structures and distribution systems that carry water for irrigation, municipal and industrial uses. 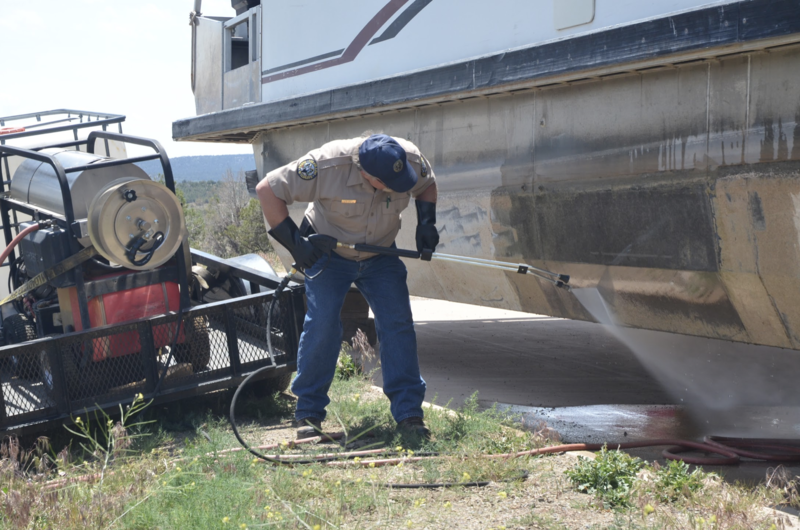 Mussels also infest boats and damage engines. 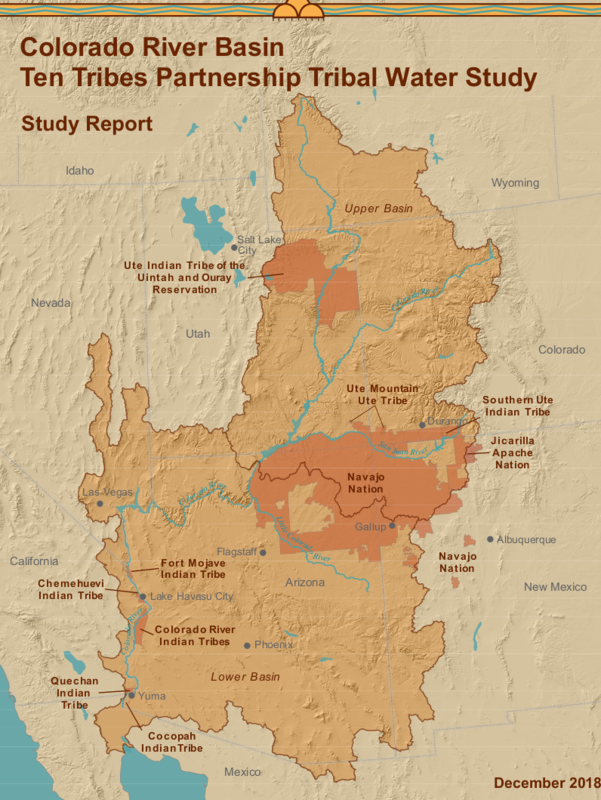 The Bureau of Reclamation and the Ten Tribes Partnership have released the long-awaited Tribal Water Study, which you can access here. 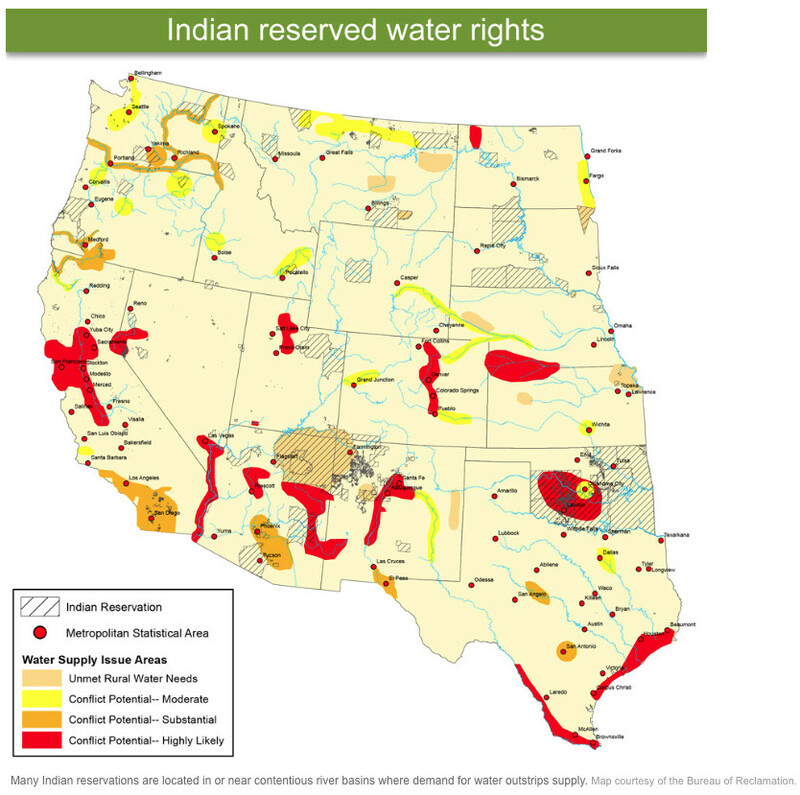 The study documents how the tribes in the partnership currently use their water in the Colorado River Basin, projects future water development, and describes potential effects of tribal water development on the Colorado River System. The San Juan Water Conser- vancy District (SJWCD) Board of Directors formally approved its budget for 2019 at a meeting on Dec. 12. The budget shows a beginning balance of $150,659 for 2019 and that revenues will be $78,775, with total available resources being $229,434. As of Dec. 12, total revenues for 2018 were listed at $77,456, and that amount is expected to remain the same at year-end. The district is anticipated to have $250,708 on hand at the end of 2018. Within the revenue section, the largest total within the 2019 budget falls under the general property taxes section. That line item totals $70,789, which is a slight increase over 2018’s amount of $68,041. The majority of line-item ex- penses for SJWCD do not total over $5,000. Those that do include $7,000 for audit expenses, $12,000 for legal and $12,000 for support services. Anticipated 2018 year-end ex- penses for an audit total $2,656, while year-end expenses for legal fees are $33,375. Year-end expenses for support services total $13,696. Total expenditures budgeted for 2019 come in at $78,775, while anticipated year-end expenditures for 2018 total $99,739. There will be a rate hike in 2019. 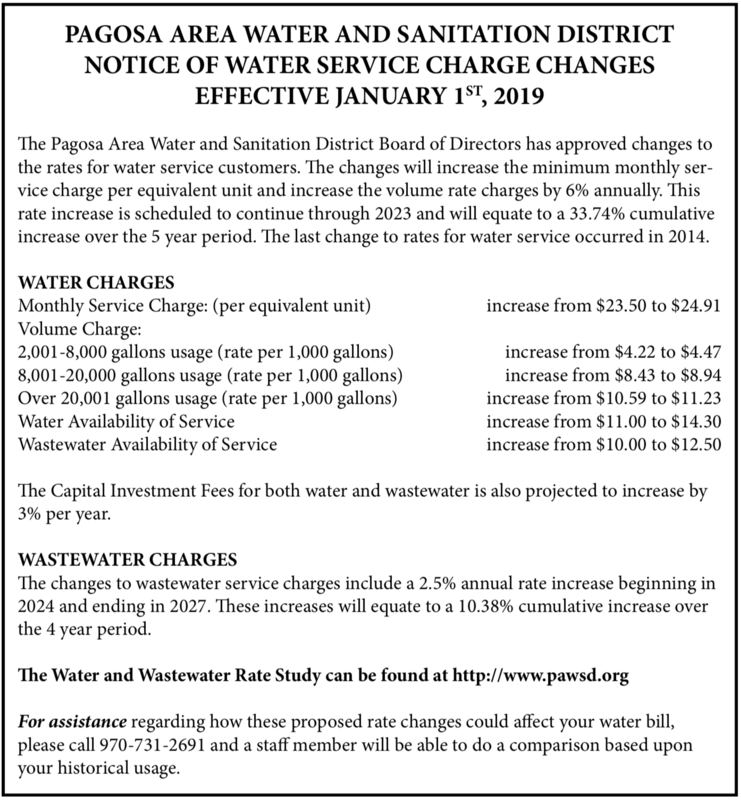 At its meeting on Dec. 13, the Pagosa Area Water and Sanitation District (PAWSD) Board of Directors approved the district’s 2019 budget. The three members of the board present — Jim Smith, Glenn Walsh and Gordon McIver — unanimously approved the document. “The Final Budget, presented for discussion, meets debt service requirements; projects improved but moderate growth and reflects the increased service charges prescribed by the Stantec Rate Study,” an agenda summary sheet on the budget states. For the General Fund, the bud- get estimates revenues totaling $1,953,015 and expenditures of $1,117,436. For the Debt Service Fund, esti- mated revenues are $1,213,490 and expenditures are $1,182,826. For the Water Enterprise Fund, budgeted revenues are $11,876,559, while budgeted expenditures are $5,922,874. For the Wastewater Enterprise Fund, estimated revenues total $5,527,668, while estimated expen- ditures total $2,434,229. • The San Juan water treatment plant’s UV project, at a cost of $706,000, is completely funded without debt. • The budget for line replacement increased to $350,000. • The budget for capital decreased by $14,000. 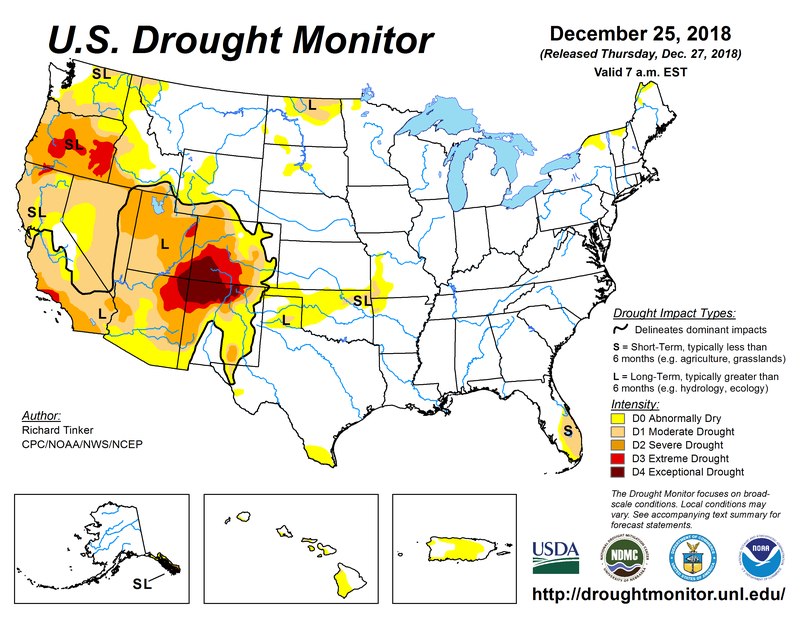 • Water rate revenues were brought more in line with history since 2018 was a drought year. Walsh also pointed out that the deficit is down in the General Fund, as well as the fact that there are no cost-of-living adjustments, fewer employees and merit-based in- creases. According to the agenda summary sheet, the operating budget includes 27 full-time equivalents for 2019.